To quickly find VMs or VM containers, you can use the search field at the bottom of the Add Object window. Enter a VM or VM container name or a part of it in the search field and click Start search or press [ENTER]. From replicas — browse existing replication jobs and select all VMs or specific VMs from replication jobs. To quickly find VMs, you can use the search field at the bottom of the Backup Browser window. Enter a VM name or a part of it in the search field and click Start search or press [ENTER]. Enter a VM name or a part of it in the search field. Veeam Backup & Replication will display possible matches. 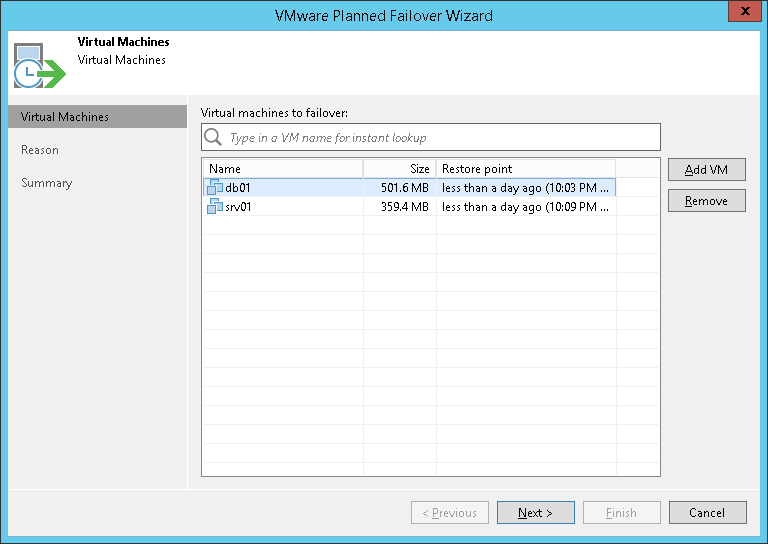 If the VM is not in the list, click the Show more link to browse existing VM replicas. Veeam Backup & Replication will open the Backup Browser window, and you can select the necessary VM replica there.